According to the Centers for Disease Control and Prevention (CDC), over 212,000 serious injuries and deaths were caused by workplace falls the last time statistics were compiled in 2009. Many of these falls occurred while workers were doing simple tasks like changing a lightbulb while standing on a ladder. 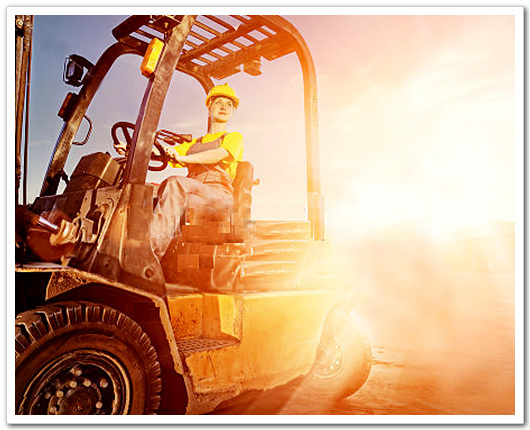 A forklift work platform can significantly reduce those risks. Aside from its most important role as a safety device, a forklift work platform can help improve productivity in the workplace without necessitating the purchase an expensive personnel lift. In fact, in many workplace environments, an inexpensive platform can be a better choice than a personnel lift. Compact in size, easy to mount on a forklift and designed for safety, a forklift work platform can be tucked out of sight when not needed and retrieved for use when needed as quickly as a ladder. Here at forkliftaccessories.com we have three economical forklift work platforms to choose from. 1. Our fold down work platform folds neatly into a 4” deep base and stands less than a foot tall when folded. It can be erected in minutes and provides rider protection with its 38” high rail and 22 ½” high midrail. The platform is 37”X37” and the platform has a load capacity of 1000 pounds. 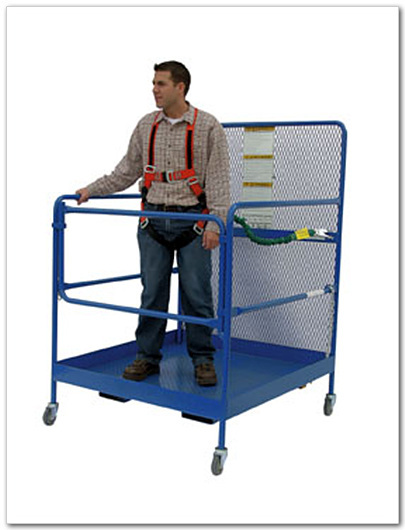 A single worker can work safely and productively at height using this forklift work platform. 2. Our budget forklift work platform may be low in price, but is not low in features. Its welded steel construction makes it a tough workplace accessory that will give years of faithful service. 42” high handrails and a 60” high expanded metal backing (84" to meet California OSHA specifications) on the 4th side help keep the rider safe and secure without impeding work performance. For even greater workplace safety, fully featured platforms also come with emergency stop button kits and a safety harness. 3. 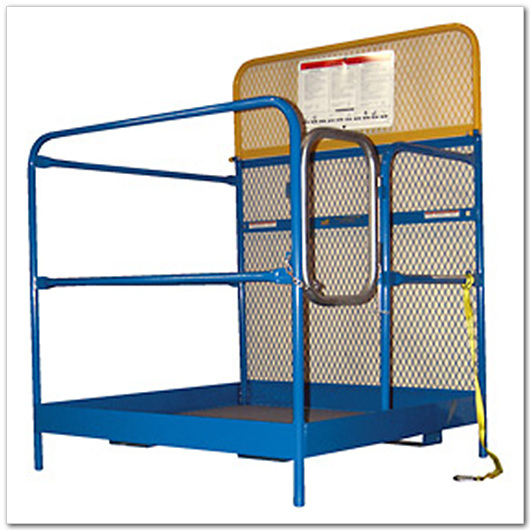 An indispensable forklift accessory in any warehouse or storage facility is the stockpicker work platform. Designed to lift both personnel and pallets to overhead racks and shelving, it is perfect for stockpicking and loading pallets. Our stockpicker work platform accommodates one rider and a 42” pallet. 42” high side handrails offer rider stability. Like our other forklift work platforms, it has a 60” high metal backing (or 84" to meet California OSHA specifications). The platform is secured to the forklift tines by means of a pin type tine lock and a 36” long chain for attaching the platform to the truck gives even extra protection. Its welded steel construction insures years of service and safety. Forkliftaccessories.com is a division of Bahrns Materials Handling Equipment & Supplies. A central Illinois institution for over 40 years, Bahrns is a more than a company name; it is a team of experts that can be trusted for their commitment to customer service. If you have any questions at all about which type of forklift work platform or other forklift accessory is best for you, contact us and our team of experts will help you make the right decision.